A hyperextended knee is where the knee joint bends too far backwards. Knee hyperextension can cause pain, swelling and instability and often affects daily activities and sports. When the knee hyperextends, stress is placed on the knee structures, particularly at the back of the knee. In severe cases, one or more of the knee ligaments may be over-stretched and either partially or completely tear. This can lead to long-term knee instability if left untreated. Here we will look at the common causes, symptoms and associated injuries with a hyperextended knee and then we will go on to look at the best treatment options to ensure a full recovery and reduce the risk of ongoing instability and further injuries. We will start by looking at knee hyperextension injuries as they are the more common problem and then we will go on to look at ongoing Genu Recurvatum Syndrome. 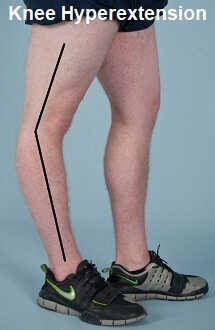 What prevents hyperextension of the knee? The four knee ligaments, the anterior and posterior cruciate ligaments and the medial and lateral collateral ligaments are the main stabilisers of the knee joint. They are strong ligaments that hold the knee bones together, but if enough force goes through the knee, the ligaments over-stretch and the knee hyperextends. Women are at greater risk of experiencing a hyperextended knee injury as their ligaments tend to be more lax than men’s which results in an increase likelihood of joint instability. Localised knee pain is common after a hyperextended knee injury. People usually describe the pain as either a mild ache or sharp pain at the back of their knee, or occasionally a pinching pain at the front of the knee if the anterior structures have been damaged. It may range from mild/moderate pain in fairly minor injuries where there is minimal damage to the knee structures to moderate/severe pain if the soft tissues e.g. ligaments have been torn. Knee swelling and bruising is common with knee hyperextension injuries. If one of the ligaments has been completely torn, swelling and bruising will be fairly immediate (within one to two hours) and is often profuse. If the damage is more minor, such as a grade 1 or 2 ligament sprain or cartilage irritation, the swelling and bruising will slowly develop over 24-48 hours and is usually fairly mild. Knee movement may be restricted after a knee hyperextension injury due to the build-up of fluid in the joint. The more swelling there is, the more movement is likely to be restricted. Knee hyperextension that is accompanied by a popping sound or sensation usually indicates that one of the knee ligaments has ruptured (completely torn). 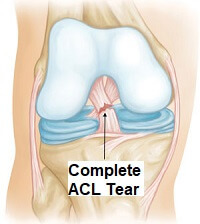 In most cases it is the ACL that is torn which will result in immediate swelling and major knee instability. Is a hyperextended knee serious? In mild cases, knee hyperextension is not serious but if the knee bends back too far, usually more than around 10 degrees, then other structures, typically the knee ligaments and cartilage, can be damaged which can be more serious. Damage to one or more of the four knee ligaments is common with a hyperextended knee. It may be a mild ligament sprain, or it could be a complete ligament tear. You will generally know if you have done something serious as the pain will be bad and it will probably be difficult to walk. 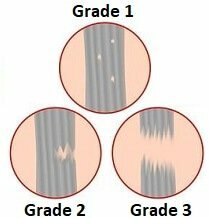 In the knee sprain section you can find out all about the three different grades of ligament sprain, how they present, how to tell which one you have and how to treat them. ACL injuries are often accompanied by a popping sound. The knee typically has to bend back into at least ten degrees of hyperextension to tear the ACL. PCL injuries are less common as the PCL is stronger than the ACL. You can find out more in the ACL injury and PCL injury sections. In some cases, one of the collateral ligaments at the side of the knee is torn, typically the MCL. When this happens the inner side of the knee is generally very tender and there is swelling and bruising on the medial side of the knee. You can find out more in the MCL tear section. The ligaments may be damaged in isolation, or multiple ligaments may be injured at the same time. In the most severe cases, all of the ligaments may be torn. When this happens, the joint capsule usually tears as well so there is actually less visible swelling as the swelling isn’t contained in the knee joint. The meniscus is a special, thick layer of cartilage that lines the knee joint. When the knee hyperextends, it can pinch the cartilage at the front of the knee joint which can cause a meniscus tear. This usually results in knee pain and swelling and depending on the type of tear, may cause knee locking. 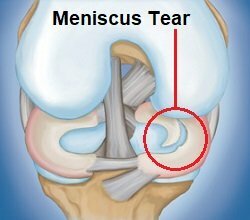 Meniscus tears are notoriously slow to heal – you can find out more in the meniscus tear section. It’s important to protect the knee from further injury. This may mean using crutches or a knee brace for a while. A hyperextended knee is prone to laxity due to the stretching of the knee ligaments. This means you are at greater risk of further knee injuries, so it’s very important to protect the knee from further damage. You will need to rest from sports until the pain and swelling has subsided. But this doesn’t mean you shouldn’t do anything. Gentle exercises are really important to keep the knee flexible and strong and they also help to reduce knee swelling. When resting it is important to keep the knee fully straight to prevent it from getting stiff and tight. Applying ice regularly to a hyperextended knee helps to reduce the pain and swelling. The sooner you can get the swelling down, the sooner you will regain your knee movement, strength and stability. 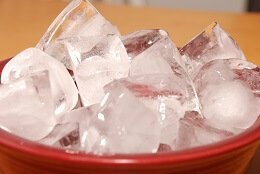 It is important to apply ice correctly – leave it on too long or apply it directly to your skin and you can actually make things worse. You can find out the best ways to safely and effectively use ice in the ice treatment section. Tubigrip Compression Bandage is a great way to reduce knee swelling and provide some gentle support to a hyperextended knee. Specially designed to apply gentle, even pressure it helps to limit and reduce the excess fluid in the knee. Find out how it works and how to use it safely and effectively in the Tubigrip section. It sounds simple, but by keeping your leg elevated when resting, you help to reduce knee swelling. You want the knee to be well supported and raised above the level of your heart to get the most benefit. Gravity helps the fluid to drain away from the knee where it can be reabsorbed by the body. Strengthening and stability exercises will help you make a full recovery from a hyperextended knee and prevent ongoing problems. If you have damaged any of the soft tissues around the knee, such as the ligaments or cartilage, it is advisable to work on a rehab programme with a physical therapist. They will work with you to help you make a full recovery and ensure you aren’t left with any long term instability or pain from your hyperextended knee which could make you more susceptible to further knee problems in the future. You can find a whole range of exercises with guidance on how to do them safely, how to progress and how to get the best results in the knee strengthening exercises section. Your doctor may prescribe painkillers or anti-inflammatory medication to help reduce the pain and swelling following a hyperextended knee. If you have torn one of the knee ligaments with your hyperextended knee injury, particularly the ACL, you may require surgery to fix the torn tendon. 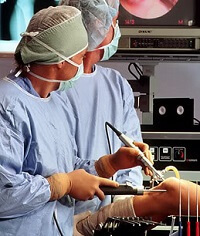 The ligament is either repaired or replaced with a graft, depending on the severity of the tear. Recovery tends to be slow but with the correct rehab you should make a full recovery. You can find out how to tell if you need surgery, what it involves and all about the recovery process in the ACL Surgery section. How long does it take for a hyperextended knee to heal? Recovering from a mild knee hyperextension injury may take as little as two weeks, but if there is associated ligament damage, it may takes months to fully recover. What do you do for hyperextended knees? In the early stages following knee hyperextension it is important to take it easy and follow PRICE principles. If you try to get back to sports too quickly you risk further injury. Keep the knee gently moving but avoid activities that hurt, especially if they cause discomfort, particularly if it takes longer than twenty minutes to settle when you rest. If you have sprained or torn any of the knee ligaments or damaged the knee cartilage, you really should work with a physical therapist on a rehab programme to ensure you regain full motion, strength, flexibility and stability at the knee. It will also help to reduce the recovery time. You may need crutches or a knee brace for a period of time. You can find out more about recovering from the possible injuries associated with a hyperextended knee in the knee sprain, ACL injury and meniscus tear sections. Genu recurvatum syndrome is a condition, rather than an injury, where the knee chronically hyperextends. This means that anytime you fully straighten the knee, it extends backwards past the normal neutral resting point of the knee. This happens with you are standing, sitting or lying down. 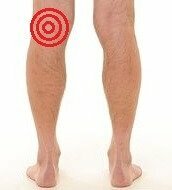 The normal range of movement at the knee is 0-135 degrees i.e. fully straight (0o) to fully bent (135o). If the knee extends more than 10 degrees past neutral, that is classed as hyperextension. Genu recurvatum is more common in women due to increased ligament laxity and there is often a genetic link. So is hyperextension bad for your knees? Mild knee hyperextension may not cause any pain but if there is increased laxity at the knee joint and repetitive hyperextension, there is increased risk of knee damage including ligament and cartilage tears. With a hyperextended knee it is really important to know whether there are any associated injuries to ensure you get the right treatment. Any injuries should be assessed by a doctor. If this isn’t sounding quite like your problem or you want some help working out what is wrong, visit the knee pain diagnosis section, but please remember, that is not a substitute for medical advice. And remember, knee strengthening exercises are vital with a hyperextended knee to build up the strength and stability of the knee to ensure a full recovery.